Anthony Mantha has dealt with high expectations since being drafted in 2013, while fans are quick to point out flaws and inconsistency, they need to stay patient with the 24-year-old. There were instantly high expectations for Mantha after he was selected 20th overall by the Detroit Red Wings five years ago and what brought him explosive success in junior hockey wasn’t going to translate immediately at the next level. He posted moderate numbers during his rookie season in the American Hockey League (AHL) after breaking his leg during the Traverse City Prospects Tournament. Many criticized him for his lack of offensive production while ignoring his injury, including Red Wings vice president Jim Devellano. Mantha remained confident in his handling of the denunciation, which showed just what type of player he’s still capable of becoming. What constitutes a power forward is debatable, but the ability to use one’s size, skating, and skill to make plays and regularly beat defensemen will be the criteria here. True power forwards have these assets and use them to drive play in today’s NHL, often finding themselves around the crease when they find the back of the net. A power forward’s crucial weapon is his ability to drive to the net with the puck, but that’s not easy for a young player breaking into the NHL. There’s hardly a power forward in the game that didn’t deal with the learning curve brought on by stronger, experienced defensemen standing between him and the net. Gaining experience, building strength, and remaining confident is what ultimately helps the sizeable wingers dig deep and drive the goal, regardless of the repercussions of playing hard against opponents. One case of such development is James van Riemsdyk. In the summer of 2012, the Philadelphia Flyers traded away van Riemsdyk to Toronto for defenseman Luke Schenn, swapping high-end picks that had failed to live up to their potential early on. The winger had 99 points (47 G, 52 A) in 196 NHL games was still just 23 years old at the time. During his first season in Toronto—the 2012-13 lockout-shortened campaign—van Riemsdyk finally reached his true potential and started a career of high consistency. In each of his six seasons in Toronto, van Riemsdyk would fall between 0.33-0.44 goals per-game and 0.67-0.76 points per-game. He scored a total of 154 goals and 294 points in 413 games with the Maple Leafs. Other power forwards have taken similar paths including, Anders Lee, Blake Wheeler, and Jamie Benn, all spent their first few seasons learning to use their frame and skill before turning in prolific scorers. Mantha may not reach the scoring ceiling of the aforementioned players, but he still has time to find the next level he’s shown flashes of. 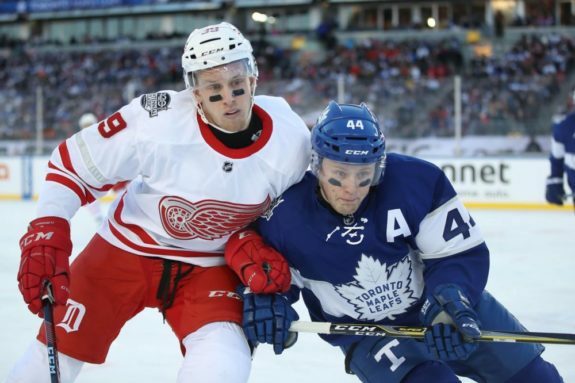 During his junior days, Mantha could rely on his elite skill, quick shot, and towering size to best weaker opponents, but playing nightly against the best players in the world means less time, tighter space, and more experienced opponents every game. Mantha earned full-time spot with Detroit in 2016-17 and recorded 17 goals and 36 points in 60 games. He largely controlled play with a 54.4 Corsi For percentage (CF%), averaging 15:54 minutes of ice time per game. Entering his first full season, Mantha set a lofty goal for himself, aiming for 30 goals and 60 points. He started the season off on a tear with 19 points (10 G, 9 A) through the first 19 games before a brawl with Calgary seemed to shake his game. He was a visibly different player over the next few games as he went scoreless in each and was subsequently called out in the media by his coach. Mantha responded by saying he had to play better. He posted three points over the next four games before his ice time dwindled from 17:27 over the first 26 games to 15:55 over the next 14. Blashill began to look elsewhere for offense and his constant line juggling didn’t help Mantha’s output with regularly rotating line mates. He would finish the season with 48 points and a team-leading 24 goals. He remained on the positive side of puck possession (51.4 CF%) and his minus-one rating was fifth on the team for players that skated in at least 60 games. Mantha’s growing experience and added strength should help him reach his potential in 2018-19, projected as a breakout candidate by fans and analysts alike. Mantha has largely relied on his strong shot for is goal scoring, but building his confidence back up will help him drive the net more and find the power forward game his team mates know he’s capable of. Red Wings center Dylan Larkin already sees another great power forward in Mantha. Larkin’s own development and confidence should help Mantha take the next step as the two find chemistry on the top line. With Mantha’s natural progression, meaning neither superstar line mates nor an outlying shooting percentage have inflated his numbers, finding that power forward game will help him reach the 30-goal plateau he wants and be the first Red Wings player to hit the mark in ten years. Mantha’s shooting percentage over the past two years has been 12.6 percent and 12.8 percent and as his shot output increased, so did his goal totals. With a higher tendency to drive the net, he can further increase his shot output and once again increased his goals. That potential growth makes him the favorite to lead the Red Wings in multiple offensive categories. He signed a two-year bridge deal to prove he can produce more offense on a more consistent basis and live up to his 20th overall draft selection. Mantha’s transition into a into a true power forward may not come as early as the 2018-19 season, but fans should remain patient as he continues to build confidence and discover the advantages that come with his size and skill.